Download a weekly Class Schedule by clicking here. Please note: Class Schedule is subject to change. Aikido is a whole-body art that teaches us how to unify mind, body, and spirit -thought with action founded by Morehei Ueshiba, also known as O’Sensei. It is a method of communication. The principles and concepts that make the art effective at neutralizing attacks are taught to be as easily applicable in other types of attacks, such as those that arise in our daily and interpersonal relationships. We learn and train to recognize/ handle the symptoms of discord effectively, without violence, so that we can then address the root cause and start the process of reconciliation. The practice involves empty hand, Bokken, and Jo work and both break fall and no-break fall classes are available. Regarded as the Mother Art of Escrima and Arnis, Filipino Kali is regarded around the world as one of the most complete martial arts systems, encompassing 12 weapons that range from empty hand (Pananjakman -kicking and Panantukan -“dirty boxing”) to edged weapons, blunt weapons, flexible and environmental weapons, and healing arts. All of these make up a regular part of the FMA curriculum at KSA. We explore Filipino Kali under the Inosanto Blend and also include its practice in our regular JKD curriculum. Jeet Kune Do (also “Jeet Kun Do“ or “Jeet Kuen Do“) is a hybrid martial arts system and life philosophy founded by Martial Artist Bruce Lee, in 1967 using direct, non-traditional, straightforward movements. The system works on the use of different ‘tools’ for different situations. However, the name Jeet Kune Do was often said by Bruce Lee to be just a name. He often referred to it as “The art of expressing the human body” in his writings and in interviews. Our Tae Kwon Do Instruction centers around traditional MuDuk Kwan Tang Soo Do, with an emphasis on inner, as well as outer, strength and agility. Classes range from forms and sparring through competition preparation. As Tae Kwon Do is also an Olympic and highly competitive sport, we offer a full range of training options. Our Chief Instructor has extensive experience as a top official under the AAU Tae Kwon Do Association, with many of our Instructors still working as coaches, referees, judges, and officials at competitions. The ASSERT Empowerment and Self-Defense curriculum is a powerful training course designed for living, not just defense. It is not a Martial Arts program! ASSERT Self-Defense has a completely different focus and is geared toward the whole family. Students learn to confront the faceless violent criminal, home invader, car-jacker, and kidnapper as well as the acquaintance, friend, or family member that becomes manipulative and potentially violent or dangerous. The primary goal of the course is to Transform Fear into Power. The ASSERT Professionals program offers litigation and liability conscious tactics designed to protect you, your family, and your loved ones, both on and off duty. Our Professional Team programs add a strong focus on team building techniques designed to enhance group tactics and increase effectiveness and efficiency. ASSERT Professional Courses offer state-of-the-art, high-risk defensive tactics and security plan development instruction, from risk assessment and research to on-the-ground defensive and protective strategy. KSA Martial Academy offers NRA Certified Firearm Instruction, utilizing both classroom and scenario-based training options in which to provide the training that our students need. 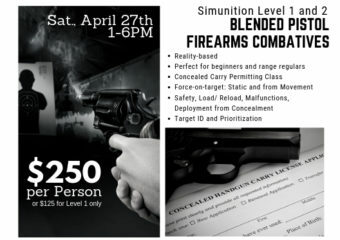 Covering material ranging from Firearm Safety to Force on Force and Home Defense, our Instructors are NRA Certified and Simunition Certified (coming soon) Instructors can take our students from the classroom, to the range, to our specialty, reality-based scenario training course.